The PV-RC300WiFi is an Advanced Mini CamStick with 720p high definition WiFi covert camera. This State-of-The- Art surveillance tool, invented by BEST (Beyond Established Science And Technology); has an HD video mode and a HD still photo surveillance mode. The built-in WiFi will allow you to control, view, see and download files instantly with your smartphone, tablet or computer. The PV-RC300W also has motion detection so this high tech tool can be used both as a walk around surveillance tool or a stationary in place covert video operation tool. When using it as a walk around video surveillance tool the PV-RC300W can be used with a removable clip that can be applied to the unit in either the front or the back so you have a number of ways to body mount the unit! New Innovative WiFi Security Advanced Technology: The load of stuff you have to worry about when it comes to conducting covert video operations just got lighter! With WiFi enabled covert video solutions, you can now instantly review your covert video walk around legal surveillance footage on your smartphone or tablet. Not only that, you can live stream your covert video to a smartphone or tablet as it is happening obtaining instant evidence results! WiFi enabled covert video products illuminate the worry and time lag of getting the covert video evidence from the unit into a format for viewing and presentation instantly and wirelessly! Not only that, you don't need to worry about rather the format can download to an Apple OS System or Windows System as you can now wirelessly send download and view to either! 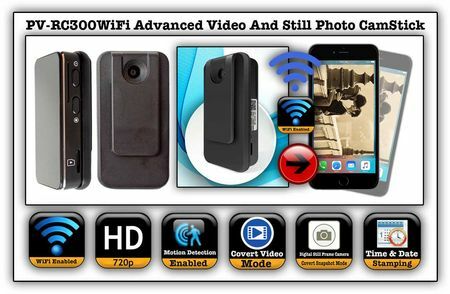 You can now quickly and easily download and review your covert video on your smartphone or tablet through the new Innovative WiFi Security Advanced Technology from Beyond Established Science And Technology which is the BEST technology. BEST WiFi Security is WiFi stability, WiFi faster,WiF safer,WiFi transmission more private and WiFi more professional is what the New WiFi Security Brand Advanced Technology for use with covert video systems is now built right into this product! You can read more about it at the end of this page. With the introduction of the first WiFi Security enabled system from BEST, you no longer have to worry about wires and can securely stream your covert video to either a Windows or Apple OS system. New Innovative IP Enabled Technology: With WiFi enabled ability, you can also live stream your covert video operation as it happens! This lets others in your covert video operation watch the building covert video evidence in real time as it is being gathered. BEST Technology has combined the ability to IP Enable this covert video recording system which means that you can remotely view and remotely control the video as it happens from anywhere in the world. Think about that for a second! What that means is you can place the PV-AC100 New Generation Covert Video AC Power Adapter Camera where you want it, adjust the angle of the camera, and you your covert video operation is set for however long you need it to be without any worry of battery power or running out of space to record video. You can now access the video evidence and control it remotely from anywhere in the world. You can download your video remotely and control the camera remotely! Only BEST cutting-edge technology gives you these covert video advantages! Why Full 720p HD? With the introduction of full HD resolution, you obtain clear and crisp video results which are courtroom evidence ready! Not only that, the extra resolution gives you a surveillance advantage since you can blow up frames much easier for a positive ID when you need it. Unlike many consumer grade look-a-like tinker toy spy gadgets, professional grade products lets you adjust the resolution recording when you need to! The Advanced Mini WiFi CamStick Spy Camera/DVR with 720p high definition. This State-of-The- Art surveillance tool, invented by BEST (Beyond Established Science And Technology); has an HD video mode and a HD still photo surveillance mode. The built-in WiFi will allow you to control, view, see and download files instantly with your smartphone, tablet or computer. The PV-RC300W also has motion detection so this high tech tool can be used both as a walk around surveillance tool or a stationary in place covert video operation tool. When using it as a walk around video surveillance tool the PV-RC300W can be used with a removable clip that can be applied to the unit in either the front or the back so you have a number of ways to body mount the unit! It's New Innovative WiFi Security Advanced Technology: The load of stuff you have to worry about when it comes to conducting covert video operations just got lighter! With WiFi enabled covert video solutions, you can now instantly review your covert video walk around legal surveillance footage on your smartphone or tablet. Not only that, you can live stream your covert video to a smartphone or tablet as it is happening obtaining instant evidence results! WiFi enabled covert video products illuminate the worry and time lag of getting the covert video evidence from the unit into a format for viewing and presentation instantly and wirelessly! Not only that, you don't need to worry about rather the format can download to an Apple OS System or Windows System as you can now wirelessly send download and view to either! Independent main chip construction design without cost concern, making the WIFI have higher priority for the resources of the system which allow it operate much more stable than other kinds of the market in any crucial condition and environment. A premium design for every part ofthe system making the integrated performance output hi-speed res- ponse including no any leg while streaming a real 720p@25fps videothrough WIFI. Most friendly and clearly UI design on both device hardwareand APP software. Highly confidential of the data transmission which been encrypted for all data packets been sent, only will be decrypted receiving by the special APP. The only battery lifetime status can be updated and previewed remotely via WIFI in real time instant & precisely.